Let’s start with admitting I’m a mechanical moron. Used to do car and all bike maintenance, but no time and current car complexities have ceased my efforts. The repair I did today will be viewed as blasphemy by the able skilled and Porsche purists. I’m willing to humble myself and take the heat to save $350 for a new wind screen for my cab. 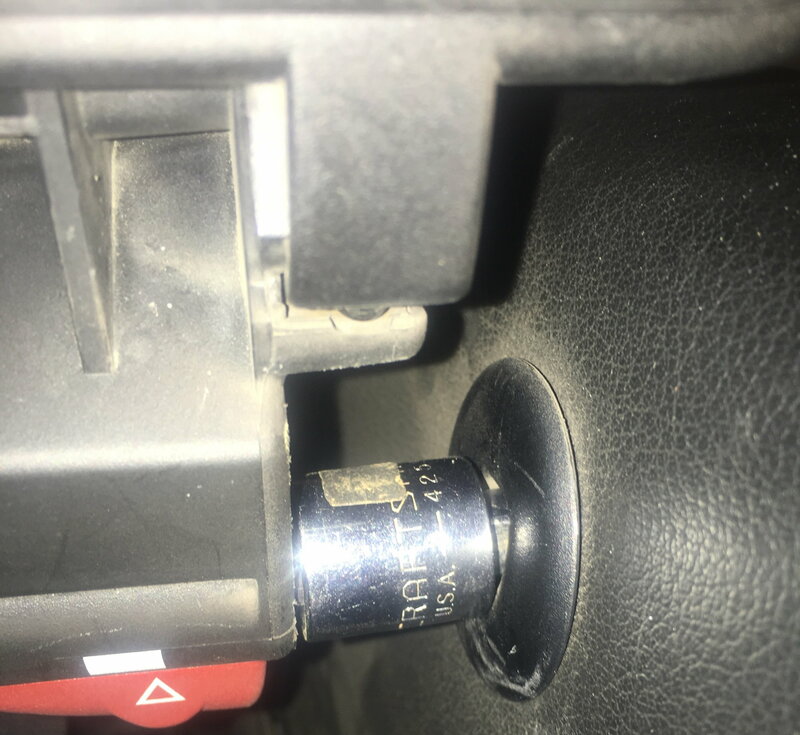 Some idiot (not me even though I can be one) moved drivers seat back until it broke off the male part of windscreen that fits into the mounting hole. I lived with it for a while but realized it was starting to rub on outside of the insert, so figured needed to correct or I’d need to spend $10 on new insert. Even broken on one side it worked just fine at speeds up to 120 on toll road. I sat with a good scotch and pondered. How can I save $350?? Realized by using a rasp to reduce the remaining post, I could shove a socket reducer adapter on it and it would fit in the female receptacle. Viola!! Works perfectly, and I figure it’s below the screen and no one will notice. If they do, I’ll fine them for a new screen. Do I feel bad doing a hack repair? Sort of. Do I feel $350 bad? NO! I post my fix cause I figure same issue has happened to others and if they’re like me and hate to buy new screen can try it. It’s pathetic really, I spend fortune replacing tires long before hitting wear bar, but can’t bring myself to get new wind screen. Wind screen does good job eliminating wind back drafts, and at night keeps headlights behind you from flooding cabin. I leave mine up even if have top up. It does reduce available seat travel, especially the back. If you have moron that likes to recline a lot, yes it can break the post. I’m 6’3”, but like proper upright seating position, and it doesn’t negate my ability to position seat. Not sure it’s stronger this way, but at least will pop off if someone goes too far back, and I can just put it back together. If I was more ****, I’d plasti dip it black, but it’s hardly visible like it is.